Will all the ships be unique in the game? Or do you intend to generate a few models for each faction? Squadrons of identical ships can look pretty nice. I think the plan is for the ships basic shape to be attached to the blueprint for it, so squads could all have the same blueprint and would look the same. You could however, change their hardpoint equipment to give them different capabilities. Not sure on the tracking of history for pilots and ships, but I would think most of those stats would be tied to the pilot if they were being logged. If they aren't, it should be very easy to mod in a significant event logger that displays pilot stats, considering what Josh has shown us previously for structure. Also, seen some talk about orienting as if there is an "up". Shouldn't players always orient as if the nearest planet is down? Idk where I read that once in a scifi novel, but you take the largest orbital body nearby and treat it as "down", without respect to the equator or the planets rotation. Anywhere you are around the planet, the closest point on the surface is always down. Hey Lindsey, these pictures are phenominal! Im amazed at the progress made in such a short amount of time. These are starting to look like intentionally designed ships rather than procedural. This will probably not be a thing. Thrusters do not represent the ship's engine(s). A ship with two thrusters could potentially fly as fast as, or faster than, a ship with four. They may affect thrust if you target and destroy them individually, but that could go either way at this point. Because this affects how much DPS you're able to deal, the number of weapons you see on the ship will be equal to the number you have installed. I don't think a pilot's individual skill will be tracked - an RPG element like that is very non-Freelancer and would be difficult to implement satisfactorily into the planned systems, for both gameplay and technical reasons. When I referenced "up", I only referenced it in terms to landing, really. The most important part is, which way is "forward" and which way is "backwards". It's easy to tell which side is the back - look for the thrusters. But which side is the front? If you're looking at any side except for the rear, it may not be immediately obvious - especially if the ship has stopped near an asteroid to mine. As to the orientation, the plan is for the universe to have an "up" and a "down" specifically, like in Freelancer. A more realistic sci-fi sim might have what you describe, but Josh has always put "fun" and "gameplay" ahead of realism, and the simple fact is that what you describe would be rather disorienting. Humans don't think well in 3D. We're more comfortable with two dimensions. It makes for better maps, too. or you take the ecliptic of the system as the base plane with the positive ω vector of the general rotation of the system's major bodies as "up". defined base plane (all the major bodies are on it anyway) and a defined up direction. that works everywhere in a system, not only the vicinity of major bodies. +1 to all of Talv's replies. I have two algorithms right now: Classic and Surreal. 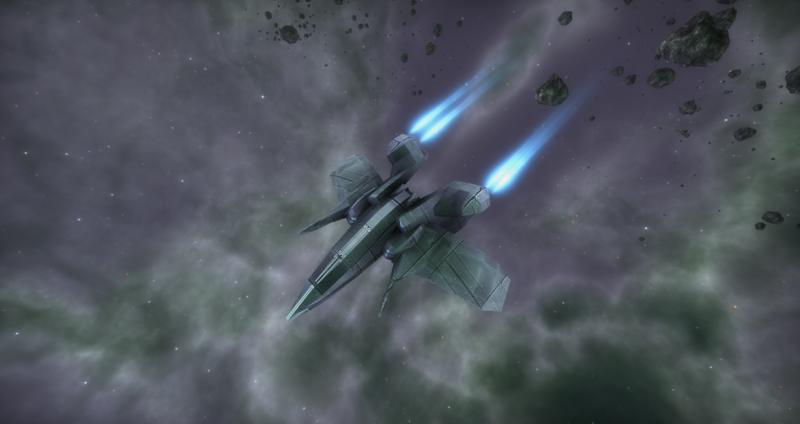 Classic creates a very standard fighter/bomber type, and Surreal creates a fighter-sized ship, but with more unique variation. X-Wing is definitely possible in Classic, wheras Tie-Fighter is more likely to be Surreal because of the spherical hull. I'm probably not going to get more granular than this between now and PAX. The Classic fighter algorithm produces consistently good ships almost 100% of the time. The Surreal one... gets a little strange, but I think they all at least look interesting. I take around 100 screenshots a day and filter it down to about 30, so that means the cream-of-the-crop you're seeing is 30% of the algorithm output. 1. Windows (again ) could give some better orientation. Especially for fighters a cockpit window texture would basically be a "this side up" pointer. Windows & other texturing features are a WIP! .... Shouldn't players always orient as if the nearest planet is down? Idk where I read that once in a scifi novel, but you take the largest orbital body nearby and treat it as "down", without respect to the equator or the planets rotation. Anywhere you are around the planet, the closest point on the surface is always down. Oh - and btw - Lindsey, Josh and Adam, you guys are doing some awesome work. I'm afraid Josh and Adam are not getting their share of praise as they are not procudcing so much visual output, but seeing that Josh just slaps on some engine trails while passing by tells me there is a lot of "invisible" work going on in the background. I wish everybod a really relaxing christmas season and a totally chilled new year! This whole album is great! Can you record them moving around at all? A video or gif? Or are you guys waiting until the show in 2018 for videos? Either way, these stills are awesome. Here's a link for those that want to watch the shinies in 720p (sorry, no 1080) at 60fps. Side note: YouTube's compression played havoc with the video. This is a raw, unedited recording of the LT shipgen sandbox. I'm running it on a Nvidia 1050Ti mobile graphics card. Framerate stays over 300fps in most cases, sometimes going almost as high as 400fps. I was accidentally running it on my laptop's Intel integrated graphics chip at first - it managed a consistent 60fps, and although recording caused it to stutter a little, it still stayed above 25fps. In other words: performance is outstanding. As you guys know, textures aren't in yet, nor are thruster/turret/weapon parts. That's probably next on the list. There are no skipped ships here, so this gives you a pretty good indication of the current average quality. In short: Lindsey isn't cherry-picking ships. They legitimately rock. Talvieno, thank you for taking the time to make this short video. It looks like LT fighters are going to be generally awesome. I look forward to seeing what Lindsey can do with larger ships in the future.